This article was originally published on Single Grain. Facebook has maintained its position as perhaps the top-ranking social media ad platform over the past few years, and that is largely thanks to their dedication to continued innovation. In this social network’s history we’ve seen the additions of a new and improved Power Editor, Call to Action buttons, and image carousel ads. Most recently, we’ve also been given Lead Ads. Facebook Lead Ads have gotten a ton of attention since they were announced, even overshadowing the long-awaited “dislike” button (which more closely resemble emojis). Created to make forms easier to fill out, and thus increase conversions—not to mention cut the cost per lead—Lead Ads have finally come out of testing and are now available to advertisers and marketers. Since Lead Ads are new, we’ve written this “How To” blog post to give you all the information you’ll need to starting running successful, highly-converting Lead Ads campaigns as soon as possible. We’ll go over what they are, why you should use them, how to create them, examples of how to use them, and upcoming additions to the format. Facebook Lead Ads: What Are They? 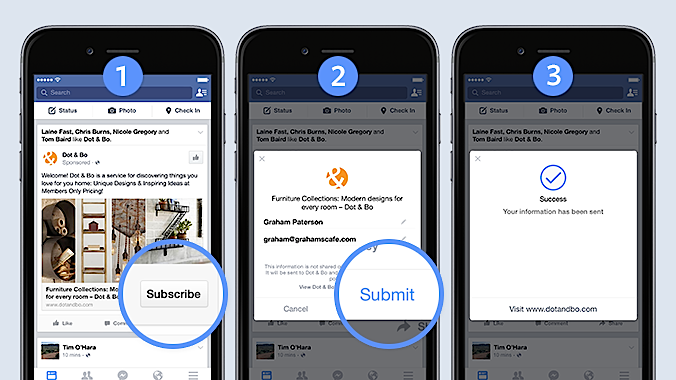 When Facebook announced Lead Ads (sometimes called “Lead Gen Ads”), they were advertised as ads that made filling out forms as simple as “Tap, Tap, Done.” It is a surprisingly accurate description of how this new type of ad works. From the user’s point of view, Lead Ads look just like the mobile ads we’re already familiar with, except when a user clicks on a Lead Ad, rather than being taken to a landing page, a form opens up in which to gather their contact information. 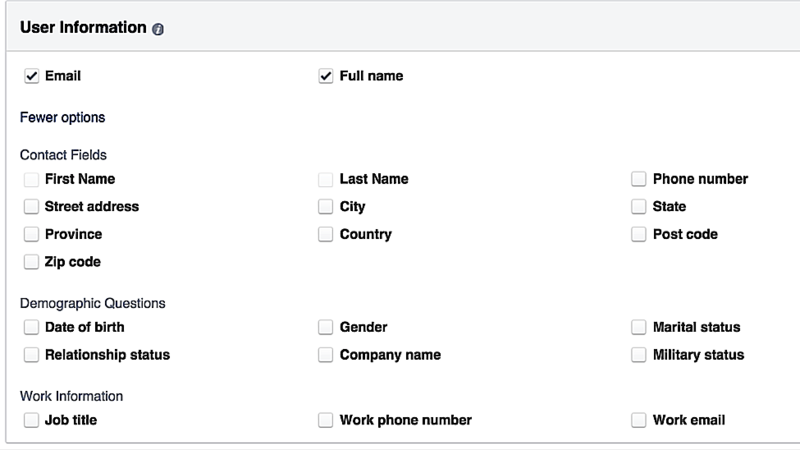 Facebook will automatically fill out as many of the fields on the form as possible with information from the user’s profile, such as name, email address, and phone number. Users can review the information, change it if they choose, and fill in any blank fields. The form can only be submitted manually so people can be assured of their privacy. 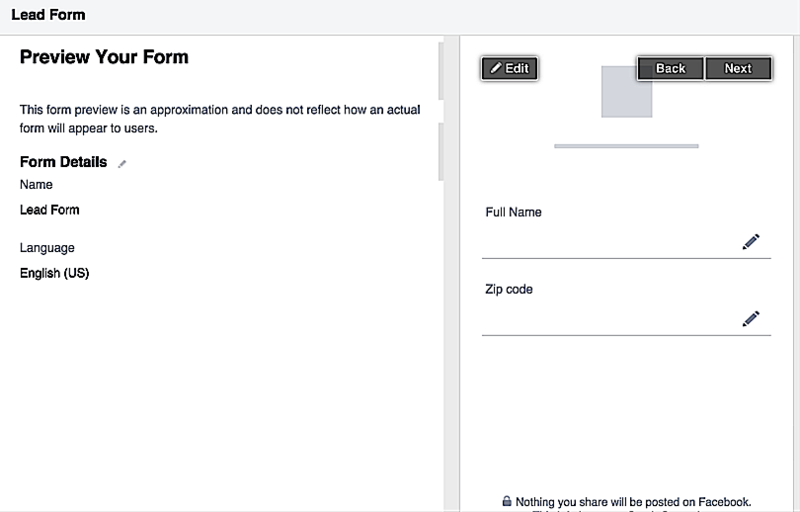 From a brand’s point of view, these forms are fully customizable and while name and contact information from Facebook profiles are always used, businesses can choose to request additional info that is beneficial for acquiring and nurturing new leads. For example, you can ask for the size of people’s business, their relationship status, or their current field of study. Facebook Lead Ads are currently only available for mobile newsfeed placement and only feature a “standard” ad format—which includes headline, image, description, and CTA button—that will then take you to the lead generation form. Both of these limitations are temporary, but we’ll talk more about that a little later on. Lead Ads offer several unique benefits that no other ad objective or ad format has yet offered either users or marketers. 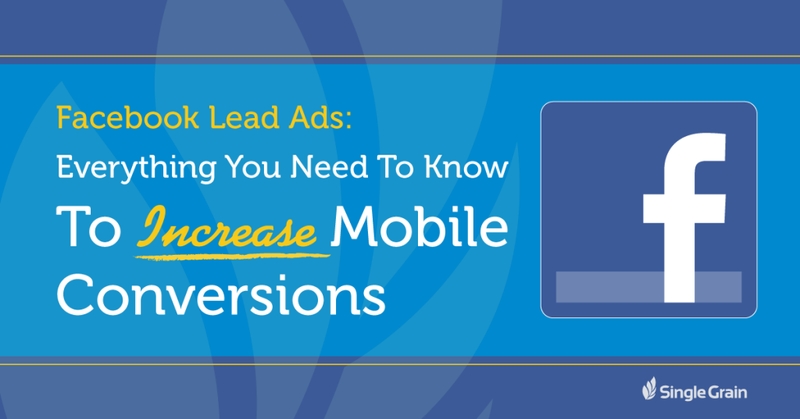 Increased mobile conversions is one of the most obvious benefits you can expect. Mobile engagement typically does well, but many marketers have a hard time getting conversions through mobile ad placements, with some case studies showing that only 34% of conversions come from mobile ads despite the fact that mobile devices reliably garner more clicks than desktop ads (63%, to be exact, in 2014). This is especially true when any type of forms are involved; it’s normally too much of a hassle for the user to leave Facebook, go to an off-site landing page (often with slow loading times), and manually fill out all those fields on a tiny mobile screen. So it’s no surprise that a lot of mobile users will click, see the form, change their mind, and leave the landing page. The lack of conversions is particularly significant considering how high the click-through rates are, and the fact that an average of 57% of a business’s Facebook Ads budget goes to mobile ads. With Lead Ads, not only will the user stay on Facebook, but the forms will give them a head start by auto-filling as much information as possible for them. The less effort required, the better—and Lead Ads capitalize on that idea. Lead Ads don’t just save users time; they save marketers and businesses plenty of time, too. 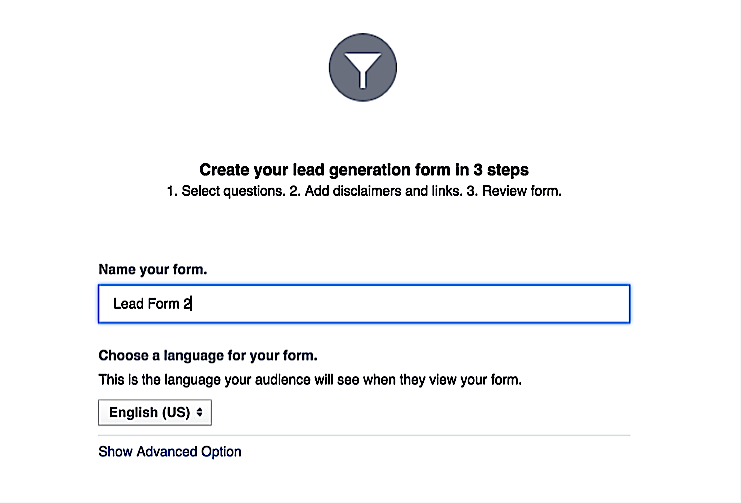 With fully customizable forms available on Facebook, marketers don’t have to create a landing page (or multiple landing pages) for lead generation campaigns anymore. It’s all right there on Facebook and easier to do than ever. You can create multiple forms for different campaigns in a matter of seconds, and when you compare that to creating, running, and hosting different landing pages, it’s easy to see why this is such a huge development for businesses. Facebook Lead Ads are currently available only through Power Editor. They are an ad objective, so you will need to create a Lead Ad campaign specifically. When you go to create a new campaign, select “Lead Generation” as your objective. After you’ve created your new campaign, go to the ad set level, where you’ll choose the Facebook Page for which you want to advertise. You’ll also see that mobile placement is currently the only placement option. You can adjust your audience targeting and choose what you want to optimize for (in this case, leads or link clicks). 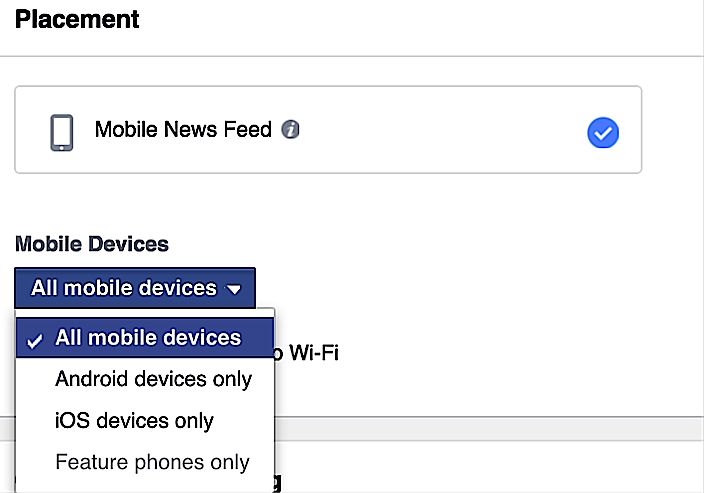 For the mobile placement option, you can choose to only target certain device types. At the ad level, you’ll create the creative aspects of your campaign as you normally would. Pay attention to the Lead Form and the CTA button, as these are different for Lead Ads. You’ll see a section of the creative aspects that is devoted to the Lead Form. You can either choose to use a form that you’ve already built or you can create a new one. Either way, it takes just a few minutes, and we’ll talk about Lead Forms in the next section. Choosing an appropriate CTA will depend largely on how you’re motivating users to submit their contact information and what you’ve promised in return. Each individual ad run might require a different CTA depending on your offer, and it’s something you should pay close attention to when split testing or changing ads quickly through Power Editor. For what it’s worth, some statistics show that while “Shop Now” is the most popular CTA choice, “Learn More” has the best performance for click-through rates. Once your ad is ready to go, you can preview it as it will appear on both the mobile newsfeed and certain selected devices. Just be sure to check your Lead Form before submitting it, because it won’t show up in the preview. Facebook Lead Ads are designed to get you leads with new potential clients, so their Lead Forms are highly customizable and offer a wide range of fields of inquiry for this reason. When you’re creating a Lead Ad, you’ll be prompted to choose a Lead Ad Form or create a new one. When you create a new Lead Form, you’ll first be asked to name it. Make sure to name it something specific so that you’ll use the correct form for the right ads in the future (and not simply “lead form 2,” which I’ve done in the example). On the next screen, you’ll be asked what questions you want to ask the user. Email address and full name are highly recommended, but not required—you can uncheck them if you’d like. When you click on “Show More Options,” you’ll see that you can also ask for other information, including first name and last name (instead of full name), address, phone number, demographic info, and work info. Facebook will have most, if not all, of this data already, so a lot of it will be auto-filled for the users and thus easier for you to get. Once you’ve selected your initial auto-filled user information, you can add up to three questions that you want users to answer. 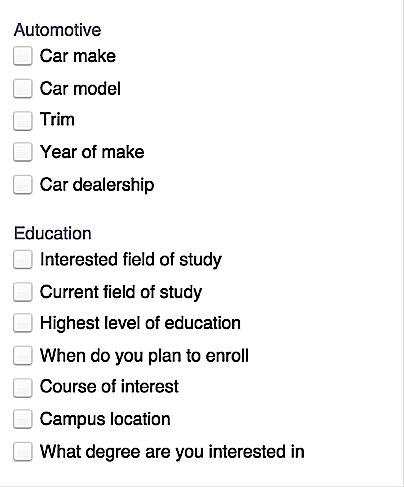 You can choose from Facebook’s options or add a custom question. 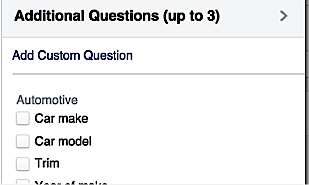 Most of these fields have a variety of question options, as seen in the examples above (but you can only ask three!). You can provide multiple-choice answers or choose to leave them open-ended. You can also opt to add a custom question. To do this, click on the “Add Custom Question,” which is listed above all the other pre-made options. Enter your question, which is limited to 50 characters, and then either select multiple-choice answers that users choose from or leave it blank if you’re asking a more open-ended question. On the next screen, you can add a link to your website that users can follow after submitting the form. Once your form is complete, you’ll be asked to review it. When you’re happy with it, hit “Create Form,” and it’s ready to run! Desktop Placement. While Lead Ads are perhaps most important for mobile placement where click-through rates tend to be high but conversions are low, that doesn’t mean they wouldn’t be effective on computers. Now that they are launched and fully functional, Facebook is working on bringing us desktop placement for Lead Ads, too. Video & Carousel Ads Formats. Both video ads and carousel image ads perform extremely well on Facebook. It’s been announced that both video and carousel ads are being brought not only to Instagram, but to Lead Ads as well, showing their importance in click-through and conversion rates. Being able to feature multiple images that either tell a story or promote multiple products or a dynamic video will likely increase conversions even further. This in particular is a development I’m personally excited to get my hands on. Carousel ads alone have, in some cases, driven costs down by 30-50% per conversion, and 20-30% per click, while simultaneously increasing click-through rates up to 75%. CRM Integration. Right now, as wonderful as Lead Ads are, it’s time consuming to access the leads that your ads generate, since you have to do so manually. Facebook will soon have the ability for CRM integration to make this easier. This won’t be native within Facebook and will only be accessible through one of Facebook’s marketing partners (currently including DriftRock, Salesforce, Eloqua, Marpost, Sailthru, and Marketo). Many of these partners offer paid CRM platforms that provide other services as well, such as custom audience integration. While some businesses won’t want to sign up with one of Facebook’s marketing partners, this addition could make collecting this information easier for all marketers within Facebook (keeping our fingers crossed!). Lead Ads are an exciting new addition to the advertising tools that Facebook already provides marketers. Designed to increase the success of lead generation campaigns, this latest tool will help you gain new customers and increase conversions for mobile users. When you combine this with the fact that Lead Ads take away the necessity for you to create different landing pages for different campaigns (and the inconvenience for users to leave Facebook), it’s easy to see why many marketers are eagerly jumping on them. Eric Siu is the founder of Growth Everywhere, a podcast where he interviews world-class entrepreneurs on business and personal growth. He is also the CEO of digital marketing agency Single Grain. You can follow Eric on Snapchat here.